On saturday afternoon, 27th of November, an afghan refugee of 24 years old, father of 3 children, was crushed between 2 trucks during his effort to climb in one of them and leave for Italy. This happened in the national road Patras-Korinthos (in Greece). According to the “Group for solidarity to refugees and immigrants”http://www.kinisipatras.gr/, the 24 year old man with other afghan refugees were trying to enter in a truck while the last one was stopped in front of a traffic light. Behind it there was another truck and his driver tried to push away the refugees by honking and approached the truck in front of him. The afghan did not manage to escape and was severely injured. He was transfered to the hospital of Patras where he passed away after 5 hours. The police characterised the incident as a slight accident and the driver was released instead of standing trial. Today afternoon there will be a demonstration in a central square of Patras against this decision. A lot of refugees in Patras, try to climb and hide in trucks that leave the port of Patras with destination ports of Italy. Some of the refugees die of suffocation inside the boat, others suffer accidents like the one stated before. As long as the borders are closed, there will be people dying during their effort to cross them. Dublin regulation must be abolished and europeen borders must open. Briefing on the 18 refugees to be deported from Chios island. The 18 under deportation refugees (from Turkey, Iraq and Iran) remain in the detention rooms of Chios police station. Two of them are 2 Turkish nationals and have submitted political asylum applications. Amongst the rest, there are refugees with recognized from the UNHCR refugee status. We expect any day now a new effort from the police to deport them to the opposite Turkish coast. On Saturday 27 November an all-night demonstration (until 7 am Sunday morning) was held outside Chios port authority, demanding the refugees’ direct release. The rally had a big impact on the local society. Many people gathered in front of the port authority during the protest (which lasted 10 hours), trying to prevent the deportation. Immigrant support organizations, political and social collectives and political parties have expressed their opposition to the government’s decision for direct deportations. During the rally, hundreds of protest phone calls, from all over Greece, were made to the Chios police headquarters and the port authority. Four sans papiers immigrant prisoners sewed their lips together with needle and thread at the Kassaveteia Prisons near Volos, central Greece, protesting their prolonged and completely unjustified imprisonment, while another three refused their meals. In the last fourteen months, all seven of them, together with another 25 Somalis, Afghanis and Palestinians, have been pushed from one prison to another, after they were arrested for the sole crime of illegally entering the country. Their release is pending while the deportation is also being legally processed. A month ago, 32 sans papiers immigrants were transferred to the Kassaveteia prisons. Though they have committed no crime and have not faced trial, they are being held captive and are being deprived their liberty and basic rights. The four sans papiers who decided to sew their lips together, as well as the three who refuse to eat, are protesting both their upcoming deportation, as well as their prolonged detention behind bars. According to certain sources, more sans papiers immigrants held in Greek prisons, are planning to take action. November 23, 2010. The bodies of four sans-papiers immigrants, believed to be from Iran, were found in an abandoned truck trailer parked in the Amfilohia region of western coastal Greece. The bodies were discovered after police examined the timber transporting trailer, which had been abandoned in the city entrance and left detached from the truck, considering its presence suspicious. In the interior of the trailer were wooden boxes, one of which contained the four dead bodies, while the others were empty and may possibly have also hidden undocumented migrants that fled the scene. According to the doctors, the immigrants died before two or three days. The truck was obviously transporting sans-papiers immigrants and the people smugglers either had forgotten the four immigrants in the boxes or they left them there after they realised that the immigrants were dead. The trailer had Italian licence plates and is believed to have been destined for the western Greek port of Patras in order to board an Italy-bound ferry boat. Frontex has released an updated Third Quarter map, January-September 2010, showing data regarding the situation at the external borders. Note the information on the map pre-dates the deployment of the Frontex RABIT forces to the Greek border in October/November. The data shows a 369% increase in detected irregular crossings along the Greek-Turkey land border over the first three quarters of 2010 compared to 2009. On November 15, 2010, 4 Greeks holding hunting shotguns attacked 2 immigrants in Kastelli beach at Creta island. The 2 Palestinians suffered heavy beating. They were both brought to hospital. 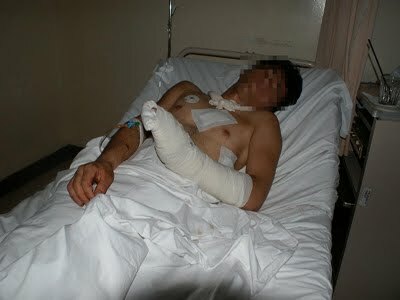 One had wounds on his head and got 24 stitches and the other broken leg and arm (photo). On November 16, 2010, policemen, for no apparent reason, arrested an Afghan immigrant who was working at a Lidl super market in Athens. They brought him to Peristeri police station, were they systematically tortured him (photo 1, 2). On November 18, 2010, the ministry of public order presented the new greek legislation on asylum policy and immigration. It involves the creation of a new asylum agency, the construction of screening centres and the use of former military camps for deportation lagers. P.S. And some good news… the iranian hunger strikers were granted asylum. The “crane struggle” starts on October 30th, during a free, unauthorized demonstration of about 100 people in Brescia, supporting the many thousands of immigrants in Italy, who are forced to work illegally and live underground for years, being subject to frauds, blackmails and any sort of unjustice by the unfair (and actually also un-constitutional) Bossi-Fini Law. 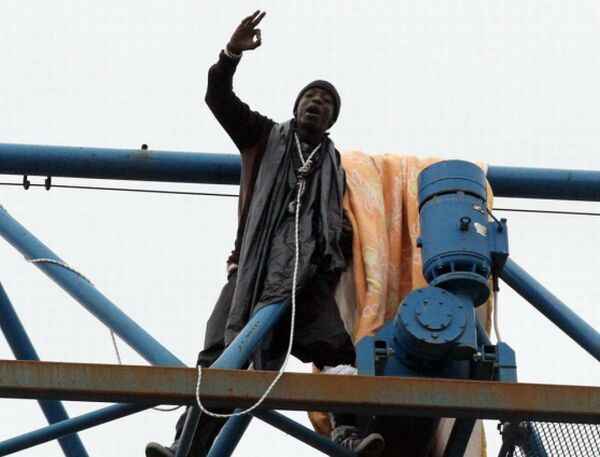 While the demonstrators seem to be effectively holding back the police cordon, some people get arrested and 6 men from Pakistan, India, Egupt, Senegal and Morocco climb up the 35-meter crane and begin a protest against the injustices suffered by about 1700 immigrants in Brescia: After having applied for the ‘colfs and carers’ ranking list (paying the Brescia Prefecture 500Euro), these people were dropped from it for having produced false employment documents (most likely sold to them by swindlers) or were receiving warning orders of eviction from Italy. For the rest of the month, supporters of the cause picket the building site around the crane and show their solidarity: Squatted social centres with banners and sit-ins, the association Diritti per Tutti by negotiating with the authorities, NGO Pax Christi by interceding on their behalf, Charitas by supplying clothes and food, the adjoining parish of San Faustino’s by providing room for the night. At first, the media coverage is rather low and only RAI 3 and Radio Onda d’Urto follow the protest with constant broadcasts. While some commentators label the 6 guys “the international workers avant-garde”, the president of Ethnoland Otto Bitjoka, though he supports the cause, dismisses this kind of spectacular rhetoric, feeling that mediatic distortions might offer a pretext for further evictions and the justification of racism. On the 5th day, Father Toffari’s mediation results in the police suggesting an alternative site for the protest. The immigrants immediately “smell a rat” and refuse the offer, threatening to come crashing down from the top of the crane if forced to give up. On November 8th, Arun, Papa, Sajad, Jimi, Rachid and Singh throw chunks of iron and bottles of urine to prevent the installation of a safety net which would prepare the grounds for their the evacuation. The police attacks with a blitz to clear off the site around the crane: 25 people are arrested, of which 6 ratified by the magistrate. One is a metal worker and Fiom union representative. November 11th: Singh the Indian is promised ‘humanitarian’ treatment by a government representative of his country, agrees to get off the crane but is arrested, tried “for serious criminal offence”, sentenced to 2 years imprisonment, and evicted from Italy within 24 hours. November 14th: During the 1000-strong anti-racist demonstration, about 60 guys start a battle with stones, bottles, paper bombs and smoke bombs, aiming at breaking through the police barrier which has been blocking off the crane site for 8 days. In the meanwhile Papa has also got off the crane, possibly during the clash or the night before, but no media has reported it and apparently noone knows where he ended up. On November 15th the ‘craners’ get off, thanks to the negotiation of the CGIL union and the Brescia’s Diocese that achieve the inclusion of the 4 immigrants in the lists for regular work and residence permit in Italy. A great victory, but still a partial one: Thousands of immigrants in Brescia and many more in the whole country are still formally sans-papiers, which in fortress Europe is absurdly defined as a crime. 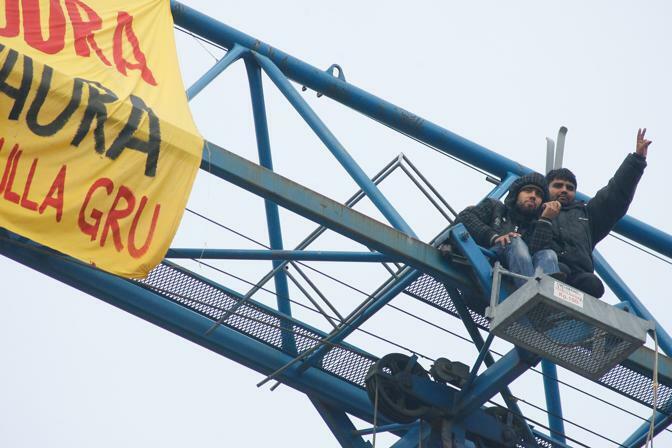 Four hunger-striking immigrants have blockaded themselves on top of a crane since Οcttober 30 in the Italian city of Brescia in a desperate protest that has attracted national attention. Thousands of people have taken to the streets of Brescia in recent days to support the crane protesters and demand greater rights for immigrants. 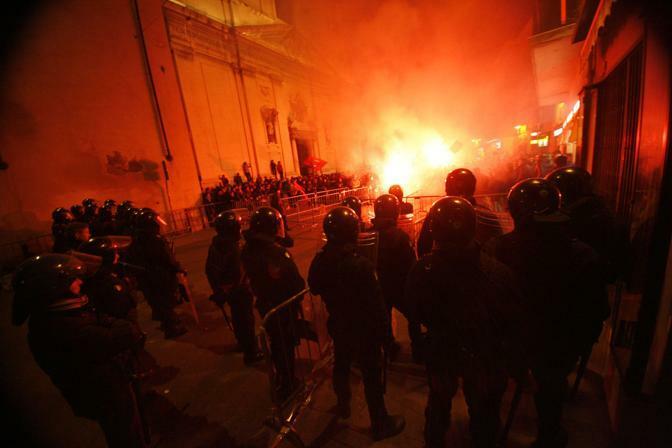 On Saturday November 13 there were clashes with the police. On the afternoon of Saturday November 13, a 21-year-old immigrant from Poland was killed outside the notorious Aghios Panteleimonas police station in Athens, because, according to the police, he jumped from a third floor window of the police station trying to escape.